A feature of the school is its excellent hydrotherapy (swimming) program which is designed to improve the student's overall competency levels including motor development, spatial orientation, physical strength, psychological well-being and social participation. 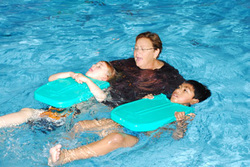 It is also the most eagerly anticipated session for all the students who will do ANYTHING to be able to go swimming. It's a great reward for behaviour modification programs. RRE – Responding Reflecting and Evaluating. To support classroom programs with music based activities. To support behavioural programs with music based activities. To integrate Belmay satellite class students with other Belmay students. Students demonstrate their skills at a School Assembly each Wednesday and at an end of year Graduation Concert. To provide students with a fun language rich environment. To use LOTE as a vehicle for developing attending behaviour, using contextual cues and body language and to provide increased opportunities for interactions between students and staff. To promote the ability of students as ‘Active learners’ (i.e can learn new things). To develop within students an understanding of other cultures. At Carson Street, we'd like to think that we take early intervention as the opportunity to provide preparation for school, be that an integrated, semi-integrated or segregated situation. The early essential skills of toilet training, sharing, small group interaction, play skills, fine motor activities, communication plus swimming and physical education form the basis for an all round education. Staff use Auslan signing, key word signing using Auslan signs (also Makaton if required)), and are familiar with a variety of augmentive communication devices, should they be necessary accessories for the non-verbal student.